On Friday nights at the Highwood Bocce Club, there are no bocce leagues but there’s plenty of activity: pickup games on the four bocce courts, five animated tables of card games, and the bar is open. The Highwood Bocce Club is not like a bowling alley, where you pay by the game and might not know anyone else. This is a social club, and a lot of the members have been around since it was founded by Italian immigrants in 1969. These days there are younger members too. Maurizio Perrelli started playing as a teenager. “I walked in to hang out with my old man who was playing cards and then I started rolling a couple of balls and I fell in love with the game,” Perrelli said. Now age 30, he’s the reigning club champion. On the next court is last year’s champion, Franco DeLuca. “We were little kids in Italy, in a small town. There’s not much to do, so you play bocce all day,” he remembers with a laugh. In 1969, a large majority of Highwood was Italian. It’s always been a modest community and has long had many tradesmen. In fact, the Highwood Bocce Club building was built by its members. Today, as the club loses some of its older members, Pieracci is eager to let bocce lovers know that you don’t have to be Italian to join the club. “We accept every membership!” he says. Perrelli says the basics of the game are quite simple. It starts when one player throws the small silver ball called the pallino. Past president Mario Massa is 99 years old. He doesn’t play bocce anymore, but the family room of his nearby home is a shrine to a successful international career in the sport. “I start to play my game when I was a teenager,” he tells a visitor. “And I was good. And I win a lot,” he says with a smile. Bocce can be played on many different surfaces: grass, artificial turf, clay, sand, crushed stone. In 2009, former club president Paolo Giannetti was put in charge of finding and creating the best surface. 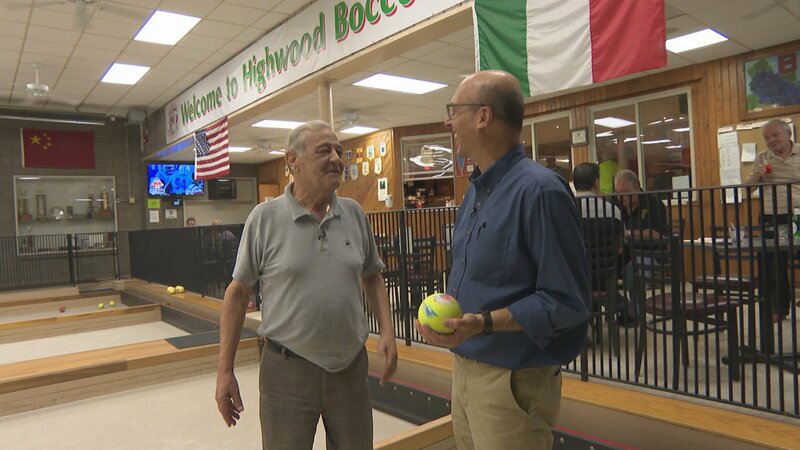 “I went to Rome,” he says, “I went to Florence, and finally found this company from Gorgonzola, Italy.” Now, he says, Highwood Bocce Club has the number one rated bocce courts in the country. Note: This story was first published on Sept. 26, 2018.